Synthetic peptide corresponding to residues in Human ISG20 (UniProt Q96AZ6). Daudi cell lysate; Human colon and tonsil tissues. Our Abpromise guarantee covers the use of ab157477 in the following tested applications. WB 1/1000 - 1/5000. Predicted molecular weight: 20 kDa. Exonuclease with specificity for single-stranded RNA and, to a lesser extent for DNA. Degrades RNA at a rate that is approximately 35-fold higher than its rate for single-stranded DNA. Involved in the antiviral function of IFN against RNA viruses. Highly expressed in peripheral blood leukocytes, spleen, thymus, colon and lung. Belongs to the exonuclease superfamily. 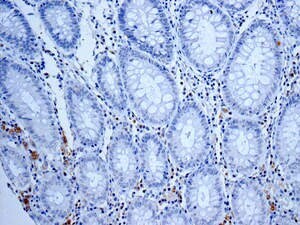 Immunohistochemical analysis of paraffin-embedded Human colon tissue labeling ISG20 with ab157477 at 1/50 dilution. 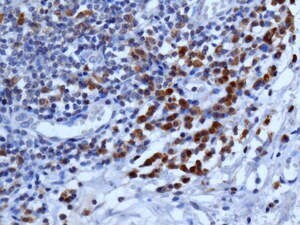 Immunohistochemical analysis of paraffin-embedded Human tonsil tissue labeling ISG20 with ab157477 at 1/50 dilution. ab157477 has not yet been referenced specifically in any publications. Publishing research using ab157477? Please let us know so that we can cite the reference in this datasheet. There are currently no Customer reviews or Questions for ab157477.